The Crosswalk has always been an inspiring event to me. We march the large cross and several smaller ones through the neighborhood symbolizing that we know that God is reviving toledo thru His Son Jesus Christ. It's whoever turns out and we march. This year afterward, we will have east activities for the children including a candy scatter and an eggs-pedition (the children will look for eggs.) The adults will be able to hang out and have a time of fellowship with some deserts of our own as well as probably coffee, some beverages, etc. We'll probably give away some gift cards and just generally have fun together. The main point is the cross walk and honoring God. After, what He did for us, we could do no less. Roving Wednesday Night study Adults 6:30pm location changing each week, house to house. Tuesday Adult Bible Study will be studying the Book of Revelation for a while. Wednesdays Roving study will be Studying The Armor of God Ephesians 6 and using a 365 devotional. Attend or see Kary Gribbles for more details. Feel free to join us for these. Everything we do is hopefully an expression of love. Please feel free to share this around. Like our facebook page and text INFO to 419.419.0095 to be included in our texting updates. Text INFO to 419.419.0095 to sign up for updates. Text GIVE to 419-419-0095 to give. Text PARTNER to commit to partner in prayer or to be updated on ways you may partner. New Heights has also been featured in the Ohio Baptist Messenger on at least two occasions as well. I had a dear friend of mine disagree with me sharply as to whether the Christian needed to be in the church or not. We quoted some verses and the end of our conversation was that he was unconvinced. He went his way which didn't work out all that well and I went mine. He's working his way back into the church now. That doesn't mean I was right or that I am smart or anything like that. I am an ordinary person with a lot of flaws. I tend to believe that that is who God wants working for Him. We are supposed to bring our stuff and let Him deal with it. We are supposed to lay these things down at His feet so to speak. That being said, I could get some very important things wrong in my life time and indeed in my walk with Christ. Still, whenever you quote the New Testament or whenever you think about the actions of the apostles realize that these things were done in the context of the local church. These things were written to, preserved by, and enacted by the local church. The universal church was the the universal church because it was the sum of the local churches and those who were finding their way into the local churches. Each of us has Jesus to help us get along in life. But I don't read that He died for all of us and suddenly convert to universalist theology. The church is the "it" that the gates of hell will not prevail against (Matt 16:18) and we are in this together. The church is not an organization and rules and democracy can easily screw up what God is trying to do in His people especially if people are not walking with Him in the first place. No amount of rules or democratic processes can make a group of people into a church. Jesus has to do that. Incidentally, Jesus seems to have the complete control over what church remains a church if you think about the "putting your lamp out," statements in revelation. That bottom-line is this, if we are His body and He is the head then we had better get working together under His direction. There's a reason why God did not put your parts in mason jars and connect them by long-range circuitry. You are meant to be a cohesive unit and so is the body of His people. These and other truths lead us to be loving, forgiving, merciful, and kind toward other members of the church while His holy nature leads us to subject ourselves to the accountability of others. He is a great God and Has designed a great system in which you may deny your need to participate (and that you are needed) and He allows that freedom. However, while He allows freedom, He has expectations. Whether it is New Heights Fellowship Baptists Church of Toledo or not, you are meant to function as part of a local body of believers. One of our Personal Trainers may be able to help you sort out which body, what is a body and what isn't, or you may just want to listen to the voice of God and let Him point you in the right direction. We are willing. He is patient. But it's time. Please accept the truth about Jesus Christ and begin anew today to live your life for Him. All gatherings are come as you are. All gatherings include a brief time of fellowship to get to know others. Drums, guitars, and digital piano are used to lead worship. Preaching is exposing the text (always BIBLE) with an invitation to respond. The church is the people. The people should be declaring God 24-7 by their actions and with their words. At least at the scheduled gatherings we come together in praise. Why is Toledo the place to go for you mission team? We can provide housing at the Life Station for free. There is a kitchen. We can accomodate trips of varying lengths. We are actively planting three different locations and have activities at the Life Station all week long. 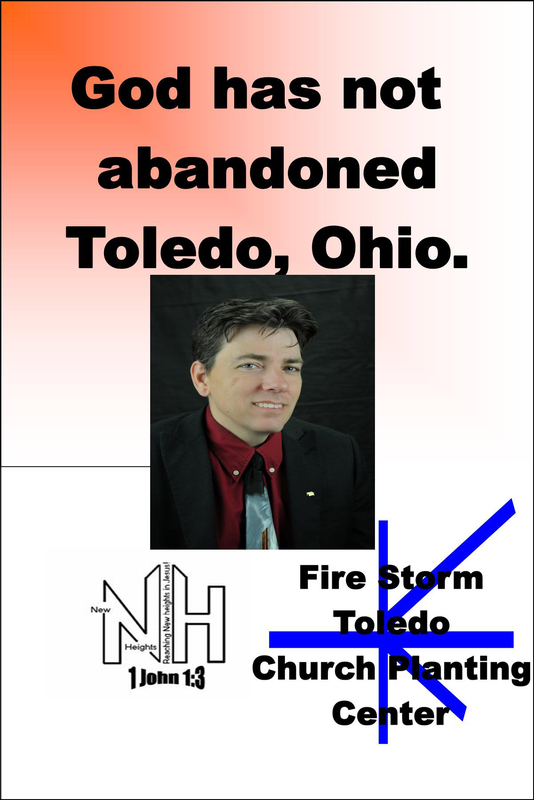 God is moving in His urban church planting movement in Toledo. We are trying to impact a 1 per 6300 ratio of evangelical churches to citizens in Lucas County. Here's a link to an article that talks about the kind of church we are. For any questions, please call 419-469-8808. *It is the vision of New Heights Fellowship to plant two more groups in the Toledo area within the next 2 to 3 years. If one of our locations does not suit your needs, go to MYNWOBA.com. On the other hand, if you want to participate in starting a new church in your area, please contact us. Desire to give? Click the Donate Now link on the top of this or any page of this website. We thank you for your support and May God Bless your sacrifice.